Edinburgh DJ Hire! Let us get your party started! Specialists in birthday parties, surprise parties, weddings, anniversaries, corporate events, club nights, bar grooves and festivals! Welcome! 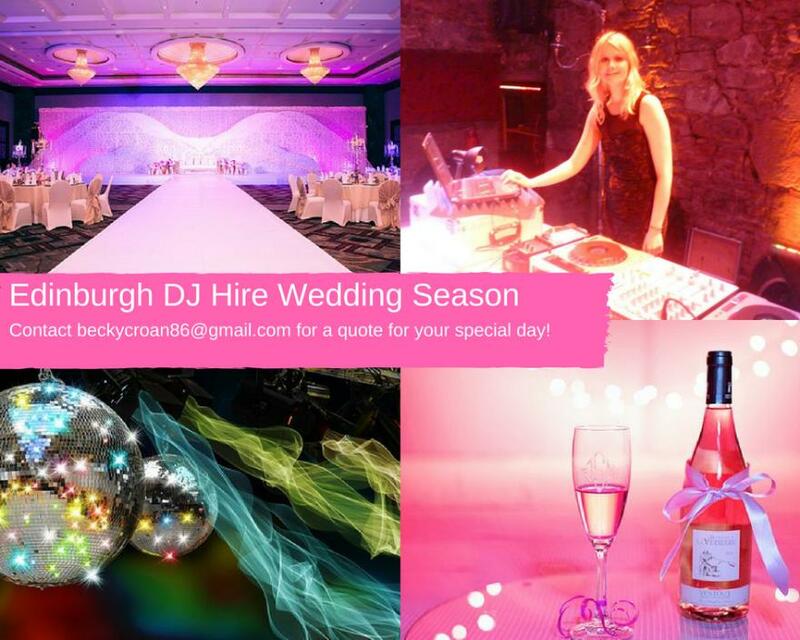 Thanks for stopping by – we are an Edinburgh based professional DJ Service. We have over twenty years experience in the music and entertainment industry. We offer bespoke DJ Services for all your parties, weddings, celebrations, corporate events and functions. Each booking comes equipped with a professional PA system, lighting show, sound system, microphone and music catering for any occasion, to fit your requirements. So what are you waiting for? Let us give you the night of your life! Email: paulcroan@gmail.com Find us on facebook! Archerfield, Royal National Gallery, Robertsons Fine Art, Abden House, Hard Rock Cafe, Heriot Watt University, Caley Bar-Waldorf Astoria, Te Amo, Balmoral Bar, Beer n Skittles, Bar 50, City Cafe, The Bongo Club, Krispy Kreme, Edinburgh College, Cruz Ship on the Shore, Indigo Yard, Hibernian FC, The Dalmahoy Country Club,The Liquid Rooms, Malmaison Hotel, Dunblane Hydro, The Jam House, Carlowrie Castle, Ritz Bar, Oxenfoord Castle, Sainsburys, Corn Exchange, Assembly Rooms, Caledonian Waldorf Astoria Hotel, Turnberry Resort, Standard Life, Royal Bank of Scotland, Audio Soup Festival, The George Hotel, Edinburgh University, The Pleasance Cabaret Bar, Absolutely Cocktail Bar, Royal Overseas Club, Capital Nightclub, Medina Nightclub, Glendevon Farm, TSB, Royal College of Physicians, Kelburn Festival, O'Rocco Pier, RAF Club Edinburgh, Joy Clothing, ToyWorld, Musselburgh Quay, Stewart Melvilles College, Melville Castle, Myreside Pavilion, Cafe Rouge, Carlton Hotel, City Chambers, The Caves, The Rowan Tree, 28 York Pl, Crammond Brig Hotel, Teviot Union, Potterow Union, Royal Botanic Gardens, Edinburgh International Conference Centre, Balmoral Hotel, Rock Ness, Belladrum Tartanheart Festival, Go North Festival, Crieff Hydro, Kilties Bar Ibiza, Savannah Beach Club Ibiza, SunSeaBar Ibiza, Sin Nightclub, Scotsman Hotel, Carberry Tower Castle, Cameo Bar, Dalhousie Castle, Voodoo Rooms, The Royal Highland Show, The Devils Cut, The Angels Share, City Nightclub, Glasgow Hilton, Espionage, Oxford International Education Group, Leith Agency, Glencourse, Deer Park Country Club, The Sun Inn, Bruntsfield Hotel, The Street Bar, The Crowne Plaza, The Glasshouse Hotel, Harmony House, Jupiter Artland, Jaccaranda Lounge Ibiza, Eden Ibiza, Teviot Creative, Anderson & Strathern, Signet Library, Shandwicks, Linekers Bar Ibiza, Prestonfield House Hotel, Ratho Hall, The Outhouse, Grey Walls, Bla- Oslo,Planet Angel-London, Electric Circus, The Tron, Garleton House, The Biscuit Factory, John Lewis and many more!